Since writing most of the stuff below, I've found this page with PDF and Microsoft “Excel” spreadsheet. My new Olympus OM-D E-M1 must be the most complicated camera I have ever seen. To compensate for this, the instruction manual is almost completely useless. After nearly a year, I'm still working on understanding it, but here I'm accumulating of the things I've changed from the standard settings. 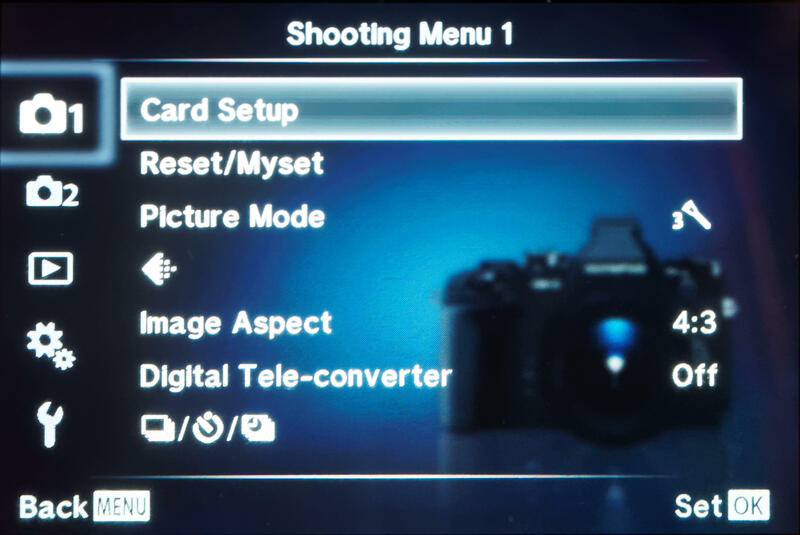 The E-M1 has two level displays, one showing lateral horizontal level, the other showing vertical level. My camera has a strange idea about the horizontal level. To change, select “Level Adjust” from Custom menu K. “Reset” sets the levels to what the camera thinks, which in my case is wrong. “Adjust” sets the level to whatever the current position of the camera is. How long to display previous image? An electronic viewfinder has many advantages over a purely optical viewfinder. 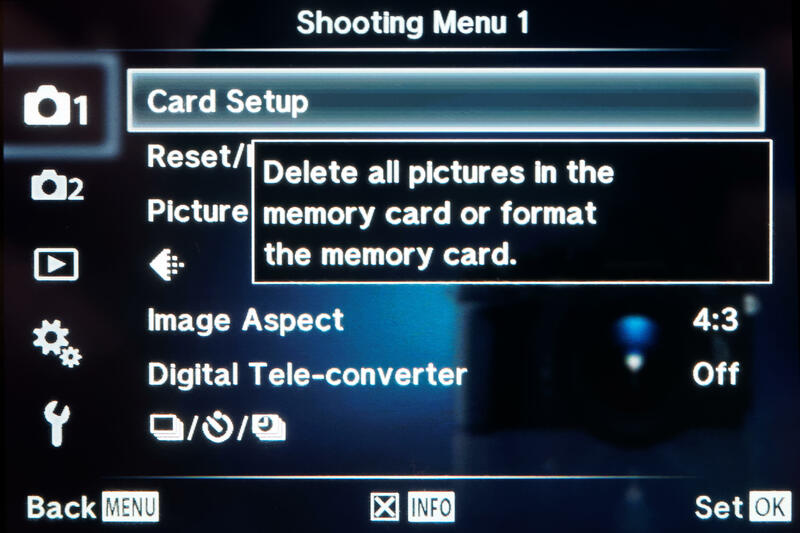 One is that when you take a photo, it is briefly displayed in the viewfinder, by default for 0.5 s. You can get rid of it sooner by half-pressing the shutter release. And the name is “Rec View”. No wonder I couldn't find it. When [AF Mode] (P. 75) is set to [C-AF], the AF does not adjust to sudden changes in subject distance. Depending on the sensitivity selected, the time it takes for the AF to adjust will change. This has little to do with the settings, which are “High”, “Normal”, “Low” and “Off”. My guess is that “High” means “respond quickly” and “Low” means “respond slowly”. There's a similar situation with the mode wheels. You can disable that with the menu D “Mode Guide” settings. File Name [Auto]: Even when a new card is inserted, the file numbers are retained from the previous card. File numbering continues from the last number used or from the highest number available on the card. [Reset]: When you insert a new card, the folder numbers starts at 100 and the file name starts at 0001. If a card containing images is inserted, the file numbers start at the number following the highest file number on the card. But that doesn't match my experience: when set to “Reset”, the file number goes back to 0 every day. “Auto” seems to be the way to go. It doesn't seem to work the first time round, so you're stuck with a discontinuity. 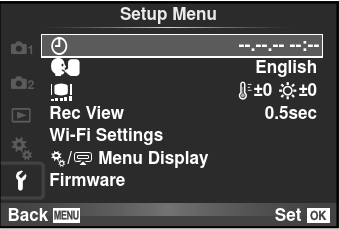 Custom Menu H, “Edit Filename” [sic]: Change first character (P) to 1 for this camera. Custom menu H: I once set my name in copyright settings. Note that the emetic ABC keyboard doesn't respond to touch. You position on the characters with the arrow keys, select the letter with OK, and finish by moving to END. When firmware 2.0 overwrote the information, I couldn't be bothered to re-enter it. This is half-documented in the manual (version 2) starting at page 77. You can get rid of the irritating “help” text by pressing the INFO button. This doesn't seem to be documented anywhere. The tiny letters to the left of the texts are the letters I refer to below. I'm still trying this out, and some of the stuff below may be contradictory. A ! at the beginning of the line means that this is the default setting (or was for firmware versions 3.0). These are settings for normal photos. They keep getting reset when new firmware updates come in. The sequence is designed to make it easier. In particular, how do you disable this silly popup text that obscures the menus? It's not documented in the “manual”. The remainder of these settings have not been updated since firmware revision 1.1. Various difficulties make use of Myset much less attractive than it might seem.